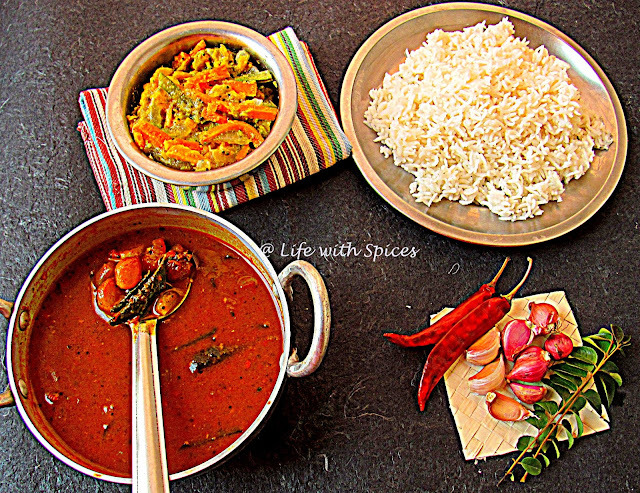 Spicy chettinad style chinna vengaya poondu kuzhambu with many spices gave so much flavor and with white rice and spoon of gingelly oil to top with rice was yumm. Aviyal and sutta appalam was perfect with this one. 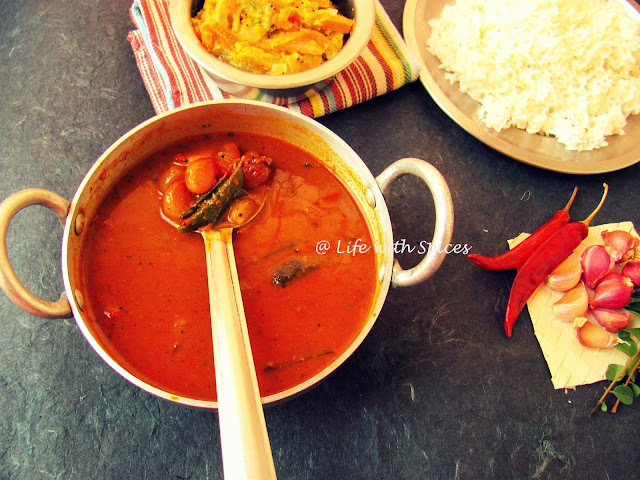 Heat oil add mustard seeds, thoor dhal, fenugreek seeds, red chilly and curry leaves and roast well. Add shallots and garlic saute well add tomatoes, salt and cook until tomatoes soften. Add chilli powder, turmeric powder, asafoetida mix well add 1 cup water, tamarind extract cook till raw smell goes. Add more water as per reqd. Add the paste cook in simmer for 5 mins and its done. Serve with hot rice and aviyal!! Fingerlicking gravy,even i love to enjoy with a bowl of rice and papds..
OMG ! Wat a color !!! Lipsmacking !! Wowww khuzhampu looks very colourful n tempting!! First time here.. U have a very lovely space.. Happy to follow you..
What a nice spread, love this kuzhambu..
Wow that looks fingerlicking good :) Yummm..!! And now that's I call as 'feast', loved ur clicks. Its bit hard to get 'chinna vengayam' here...I know its highly flavorful and the dish speaks for itself.